Absalom - It wasn't long before things started falling apart because of David's sin. It started with his son, Amnon, who was in love with his sister (half-sister actually), Tamar. Tamar was a beautiful woman and Amnon pretended to be sick so that she would come and feed him while he was lying in bed. When she she came to him, he tried to talk her into sleeping with him. She refused, so he raped her (II Samuel 13:1-18). When Tamar's brother (full-brother), Absalom, learned what had happened, he exacted retribution and had Amnon killed (II Samuel 13:24-29). When the news reached King David, he was told that Absalom had killed all his sons, not just Amnon, which was a false report. But it was enough to create chaos throughout the kingdom. Absalom fled to the land of Geshur and stayed there three years (II Samuel 13:34-38). When he returned, rebellion had been sown in his heart (perhaps by the king of Geshur, Ammihud, perhaps of his own accord), and he tried to topple his father's monarchy (II Samuel 15:10-12). 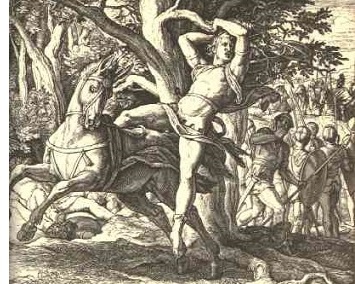 David fled (II Samuel 15:13-14). But he rallied his forces and they met Absalom's army on the battlefield.